Automotive Pedestrian Protection System Market size is estimated to exceed USD 3 billion by 2024; according to a new research report by Global Market Insights, Inc.
Increasing mobile phones usage during driving, reduced visibility at night, misjudgment while driving, and driver’s fatigue results in collisions. Increasing concerns regarding the growing number of road fatalities has led to increased deployment of automotive pedestrian protection system in vehicles. Moreover, usage of earphones by pedestrians while strolling on roads make them vulnerable to such incidences. According to the National Highway Traffic Safety Administration (NHTSA) report in 2015, over 21% road accident fatalities in the U.S. were children. Requirement to curb occurrence of such incidences is expected to generate increased adoption of safety systems thereby fueling the automotive pedestrian protection system market growth. Introduction of advanced radar system, emergency braking system and increasing strictness of safety norms across the countries are fueling the automotive pedestrian protection system market demand. For instance, in July 2016, Indian government had proposed manufacturers to deploy frontal safety technologies and proposed formulation of safety rating framework for different vehicle models. This safety test will include compulsory minimum pedestrian protection score requirement for the newly manufactured car models. Moreover, ability of these systems to perform efficiently in extreme weather conditions will propel the automotive pedestrian protection system market share from 2018 to 2024. Efficient operation of these system requires the vehicles to operate in specific speed range. This is expected to be among the major technological challenge as reducing the speed at higher rates will endanger the user and passenger’s life. Manufacturing companies are making significant efforts to overcome these limitations to provide improved safety. Moreover, high cost associated with the product manufacturing, consumer availability and replacement of passive systems once activated will hamper the automotive pedestrian protection system market growth. Introduction of stringent regulations and vehicle standards regarding the vehicle design and technologies to ensure human safety in new motor vehicles will provide strong growth prospects for the automotive pedestrian protection system market. For instance, a coalition of 20 automakers, Insurance Institute for Highway safety and National Highway Traffic Safety Administration approved safety technologies that will include collision avoidance and automatic emergency braking system as standard in new cars by September 2022, and heavy-duty trucks by 2025. Passive pedestrian protection system contributed the largest industry share in 2017, owing to its high initial adoption in passenger vehicles and the features that aid in mitigating collisions. These include pop-up hoods and external airbags activated upon the impact after the frontal collision with human. Commercial vehicles are large sized and have wider blind spots. Few automotive manufacturers that include Volvo, Subaru, and Daimler have introduced vehicles with safety technologies. OEM players are anticipated to participate in the competition by introducing innovative technologies and gain higher consumer traction. Inadvertently this will present strong growth prospects over the forecast period. OEM contributed for the largest automotive pedestrian protection system market share in 2017 and is expected to witness significant gains at around 10.5% over the forecast period. Active safety technology is in its nascent stage and the technologies are robust providing efficient performance in unfavorable weather conditions. Long operational life and high requirement to ensure human life safety are expected to drive the segment growth. 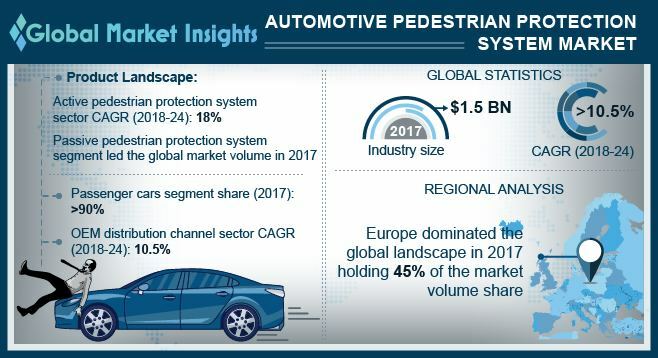 Some of the major automotive pedestrian protection system market participants include Audi AG, Autoliv Inc., BMW, Continental AG, Daimler AG, Denso Corporation, Ford, Motor Company, General Motors, Honda Motor Co., Ltd., and ZF Friedrichshafen AG. High product deployment demands owing to the increasing concerns regarding the frontal collisions, advancement in radar technologies and regulatory compliances will present favorable growth landscape through the forecast period. Industry participants are expected to focus on improving the detection capabilities of the system for providing the accurate information to assist the driver for avoiding accidents. For instance, in 2011 TRW launched its advanced pedestrian detection system with automatic emergency braking to safeguard human lives.